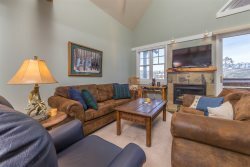 This beautiful Bozeman retreat is located on the Riverside Golf Course, within feet of the East Gallatin River. It offers a view of the Bridger Mountains and comes equipped with a little bit of everything you need for a comfortable Bozeman getaway. This quiet, three-bedroom and two and half bath home comes comfortably suited to sleep up to eight guests. The private master bedroom includes a king-sized bed, gas fireplace and separate bathroom with a large tub and relaxing steam shower. The second bedroom is fitted with a queen bed. The third bedroom has a twin/full bunk bed. There is an additional sofa sleeper located in the office. The house is also equipped with air conditioning, four satellite equipped TVs, high-speed internet, a wood burning stove in the living room, a washer/dryer, and an outside patio and barbeque. This property is PET NEGOTIABLE. Whether you are here to enjoy the world-class fishing and hunting; whitewater rafting; skiing; or shopping in historic, downtown Bozeman—you will find all that you need at the East Gallatin Retreat! Right at Home!! The house is located just north of Bozeman with very easy access to the shopping and restaurants downtown. The house is well equipped with the items for your stay. We will definitely return.